My attention was brought to the following article in which it is suggested that perhaps eReaders are not heralding the end of printed books after all. As an exercise for yourself you can work out how much stock to put in an informal telephone survey which doesn’t even control for ownership of an eReader device. But another incident had me thinking of ebooks at roughly the same point in time, which was that I went to purchase an ebook copy of Robertson Davies’s Fifth Business for a book club only to find it isn’t available in that format. I ordered the print version and started wondering why my first inclination was to buy the ebook. I have a perhaps unhealthy fondness for printed books. I’m the kind of guy who stares longingly at pictures of crowded secondhand bookstores, wishing I could be there to absorb the smell. I believe the most beautiful decor you can give a room is wall-to-wall bookshelves. And yet, I’m a technologist by trade. The fact that I can have a dozen audiobooks on my phone as well as access to a small library of digital titles is why I love living in the future. The built-in dictionary feature on my Kindle is my favorite feature of anything ever. The challenge, for book lovers, is how to reconcile these things. There is, for instance, a train of thought that says internet pricing on rapidly-shipped books and digital editions are killing local bookstores. And if you kill the bookstore, you kill the books. There are some things our 90s hubris wrought as we hurled ourselves into the digital age that were unexpected, deaths of institutions we perhaps held dear. The record store, for instance. Oh sure, you can still find them around. But those things used to be everywhere. They were haunts for me, places of refuge, familiar caverns where hours of idle time and as much of my lazily earned money as possible could disappear. Another favorite of mine from youth was the video store. Again, these exist in some form or another still, but their ubiquity in the late 80s and early 90s cannot be overstated. You know how many mobile phone stores you see as you drive through strip mall alley in any suburban township? Most of those used to be video rental shops. The worry for some is that bookstores, comparatively few as they are already, have only just recently begun to see the doom that will push them to that same brink of oblivion. If most consumers can find sufficient cinematic itch-scratching in Redbox kiosks and Netflix subscriptions, might they not be similarly satisfied with Kindles and iBook apps? 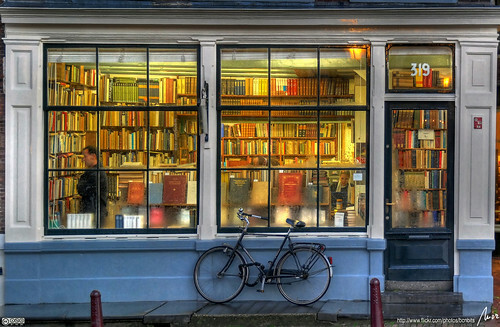 If we, as the overlapping segment of voracious readers and early adopters on the Venn diagram, race to the mad convenience of Nooks and Kobos, are we scrying the end for our beloved bookstores? Maybe. I mean, yeah, possibly. That’s how it went for record and video stores. So it goes. But then I think about my complex relationship with not just reading but finding and acquiring the books I’m going to read. Or want to read. Or would like to have on hand in case some day I may attempt to read. On the ebook side, I love that there are so many new and bold voices trying their hand at self-publishing, often offering deep discounts or even free ebooks. I’ve tried a lot of authors that I’d otherwise never have given much of a shake because of this. I also adore the immediacy of ebooks and the accompanying purchasing systems. Sometimes if I hear a piece on NPR about a new book, I don’t have to hunt for a notebook (or a notes app, let’s be real) to write down the name, I can just go buy the book. My to-read list is very long and it’s not often I’m caught between books, unsure what to start next, but on those occasions where I am and I hear something interesting, it’s wonderful to be able to exercise that instant gratification. Technology enables another reader-friendly opportunity: book security. Now, my keyboard Kindle is lamentably lacking in the 3G department so this only works occasionally, but I love that I can sync my spot between the Kindle device and the Kindle app on my phone. In practical terms this means I’m never without my book. Even if I forget my eReader and get stuck in a doctor’s waiting room or something, I can open the app and pick up where I left off. Better yet, when I get back to my device, it will jump ahead to where I was when the nurse finally called me in. Since I love to read but don’t have a lot of unbroken time blocks to sit and plough through a book, being able to take back little pockets of downtime is a real joy. But in spite of how nicely ebooks and their requisite readers fit into a busy life, I still find it next to impossible not to stop in every bookstore I see. I still crave the feel of pages turning, and the shifting weight from right to left. And I think it’s important to note that this is particular only to books. When it comes to music, for example, the delivery mechanism is incidental. I listened to cassette tapes for most of my childhood, transitioned to CDs in my teens, and couldn’t wait to get rid of the physical limitations to have the largest selection available. I have no fetish for records (though some do, and yet I notice that records then have outlived cassettes, but also that records had been made “obsolete” well before digital music came along), nor for DVDs or VHS. It is only books, which predate them all, that matter to me. Without them libraries wouldn’t exist and if there’s one thing I love more than a bookstore, it’s a library. There are all these great books, perhaps like Fifth Business, which don’t exist in ebook form yet, if ever. And the lending and borrowing of books as the most aggressive, effective form of recommendation is utterly absent in the digital realm. I can’t speak for all my fellow readers, but if accept that there is a nugget of truth in the notion that people prefer physical copies of books over digital ones, perhaps what that’s really saying is that books—as a media format—are one of the few that are worth preserving. Maybe we don’t need plastic discs to hold our movies and songs, or cartridges to hold our video games, or styrofoam for our Big Macs. But maybe we do need books. And then again, maybe we also need ebooks.